Math Power Standards - Fun in Fourth! Below is our 4th grade list of absolute 'need to knows' standards/concepts for math. Please continually practice these skills, (spiral review as we call it) because these are the basics that sometimes get forgotten! Prime Number: A prime number is a whole number greater than 1, whose only two whole-number factors are 1 and itself. Trick: The 'i' in PRIME standards for 'itself'! Composite Number: A whole number that can be divided evenly by numbers other than 1 or itself. Example: 9 can be divided evenly by 3 (as well as 1 and 9), so 9 is a composite number. But 7 cannot be divided evenly (except by 1 and 7), so is NOT a composite number (it is a prime number). Examples of composite numbers: 4, 6, 8, 9, 10, 12, 14, 15, 16, and 18. *Remember, not all composite numbers are even! Check out the red numbers, which are composite and also ODD! Factors: Factors are numbers you can multiply together to get another number. Example: The factors of 12 are 1, 2, 3, 4, 6, 12. Remember, if a number has more than 2 factors, it is also a composite number! If a number only has 2 factors (1 and itself), it is a prime number! Multiples: A multiple of a number is that number multiplied by an integer (a number). When you learned your times tables, you were learning multiples. 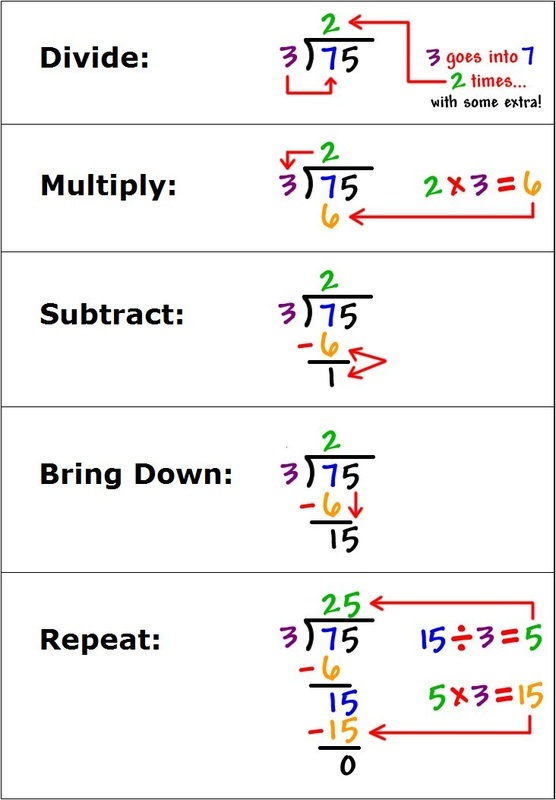 For examples, 2, 4, 6, 8, and 10 are the first five multiples of 2. To get these numbers, you multiplied 2 by 1, 2, 3, 4, and 5, which are integers. So the first five multiples of 6 are 6, 12, 18, 24, and 30. 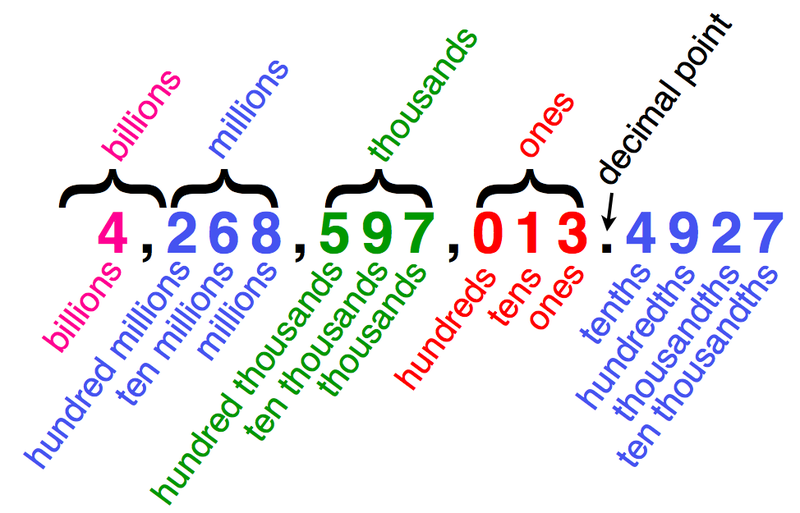 Place Value: In our decimal number system, the value of a digit depends on its place, or position, in the number. Each place has a value of 10 times the place to its right. A number in standard form is separated into groups of three digits using commas. Each of these groups is called a period. 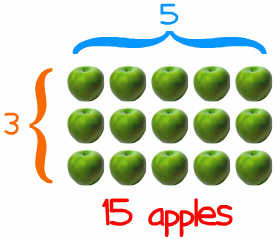 Multiplication: The basic idea of multiplication is repeated addition. 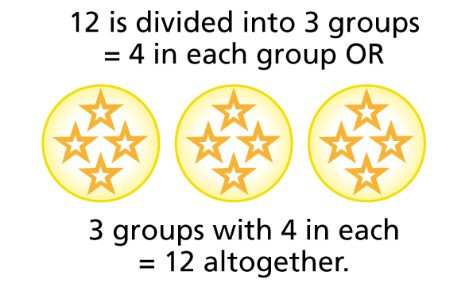 Division: Division is splitting into equal parts or groups. Example: 12 ÷ 3 = 4 . There are 12 chocolates, and 3 friends want to share them, how do they divide the chocolates?